About 10% of older adults who seek care in EDs throughout the United States experience delirium. The condition can foretell other health issues and causes distress to patients and caregivers. Delirium also puts patients at increased risk for poor outcomes. Studies indicate that the condition adds between $38 billion and $152 billion annually to healthcare expenditures in the U.S. Patients who are discharged home from the ED with unidentified delirium have 6-month mortality rates that are nearly three-fold higher than those of counterparts whose delirium is detected in the ED. However, studies show that emergency providers identify delirium in only 16% to 35% of cases. Unrecognized delirium in older adults presents a major health challenge and increases the burden placed on the healthcare system. 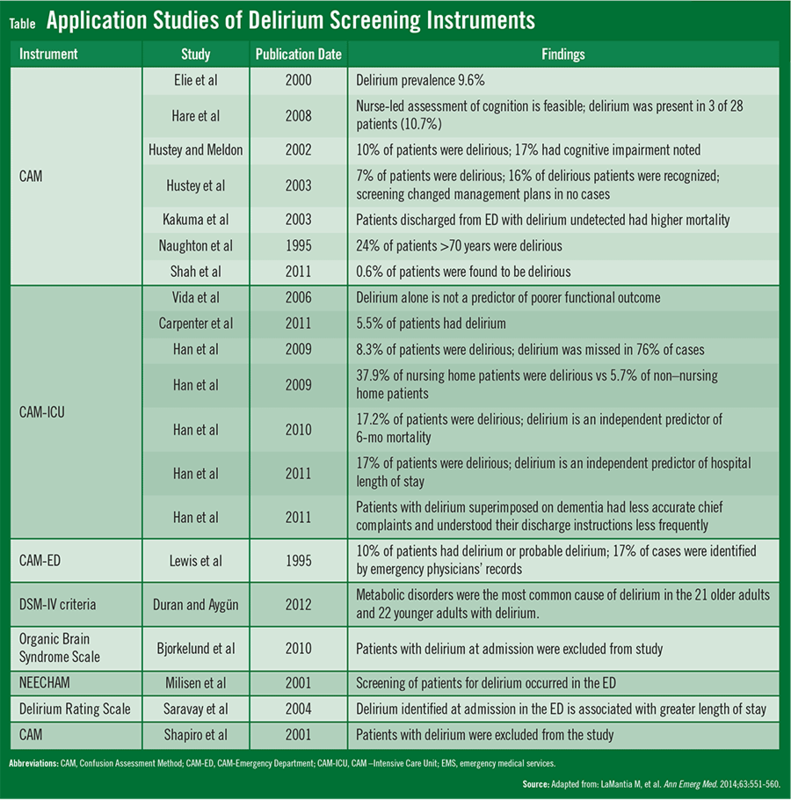 Several screening instruments have been developed to identify delirium in various settings, but the ED is a unique environment because of intense time demands and high patient volume. Caring for adults with delirium in the ED setting is challenging and requires a separately evaluated screening instrument for the condition. For a study published in Annals of Emergency Medicine, Michael A. LaMantia, MD, MPH, and colleagues conducted a systematic review of existing studies on delirium in EDs to determine why the condition is so frequently undiagnosed in older adults. “We sought to determine whether any standardized instruments had been well studied for identifying delirium in the ED,” says Dr. LaMantia. 1. Confusion Assessment Method (CAM). 4. Organic Brain Syndrome Scale. 5. Diagnostic and Statistical Manual criteria. The CAM was the most frequently used instrument, with 11 studies, followed by the CAM-ICU, with six studies (Table). The CAM assesses nine delirium elements and takes about 5 minutes to complete. The CAM-ICU, an adaptation of the CAM, includes non-verbal items, assesses four cardinal features of delirium, and has been validated in the ICU setting. Although each of these instruments has been studied in the ED setting, only CAM had undergone at least initial validation for use in the ED at the time of publication of Dr. LaMantia’s study, and CAM-ICU was undergoing a validation study. The CAM-ED was specifically designed to detect delirium among ED patients and was found to detect it in 10% of patients in a study, but the instrument has not yet been validated. “We clearly need more research to understand how delirium might be better detected within the regular flow of ED care,” says Dr. LaMantia. The problem remains that delirium is a serious condition with severe consequences for older adults. “When a patient is suspected of having delirium, there needs to be a thorough evaluation to understand what’s causing it and where that patient is going to receive the best care in the long run,” explains Dr. LaMantia. To do that, ED providers need a delirium screening tool that takes into account how it best fits into the flow of work within the ED setting. This includes how long it takes to administer and how easy it is to conduct. Until these research needs are met, Dr. LaMantia suggests that ED providers consider using the CAM or CAM-ICU instruments to screen for delirium in older adults because they have had the most studies examining their use in the ED setting. LaMantia M, Messina F, Hobgood C, Miller D. Screening for delirium in the emergency department: a systematic review. Ann Emerg Med. 2014;63:551-560. Available at http://www.annemergmed.com/article/S0196-0644(13)01584-9. Siddiqi N, House A, Holmes J. Occurrence and outcome of delirium in medical in-patients: a systematic literature review. Age Aging.2006;35:350-364. Leslie D, Marcantonio E, Zhang Y, et al. One-year health care costs associated with delirium in the elderly population. Arch Intern Med. 2008;168:27-32. Witlox J, Eurelings L, de Jonghe J, et al. Delirium in elderly patients and the risk of postdischarge mortality, institutionalization, and dementia: a meta-analysis. JAMA. 2010;304:443-451. Michael A. LaMantia, MD, MPH, has indicated to Physician’s Weekly that he has no financial interests to disclose.